Tasting events for groups & organizations from small to large! Like wine tasting, olive oil tasting is an art form in itself. Olive oils can vary in flavour depending on its region, harvest time, crop, varietal, and so on. The same holds true with vinegars. We invite you to discover some truly amazing oils, vinegars, and oil & vinegar combinations. Simply gather a few friends, a club, team, sorority, or even your office - we'll take care of the rest. Who are the tasting events for? 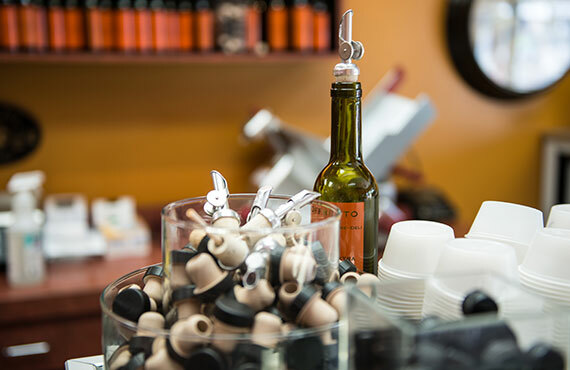 We always offer tastings in our store, and you're welcome to stop by any time to try our olive oils and balsamic vinegars. We can also bring them to your event. We can accommodate large or more intimate parties. Our tastings are down to earth, and you’ll want to bring a notebook to keep track of all the great information we’ll be sharing (but don’t worry if you forget, we’ll send you away with handouts galore!). How much does it cost for an off-site or after hours event? Tastings are a fun and memorable experience. If you have any questions, please get in touch. Call 403-278-2728 or fill out the form below.